There is a new app available for both iPhones and iPod devices called “Disney at Work: Magic Kingdom” which is is filled with scores of insights and hundreds of photos that focus on lessons in customer loyalty, leadership, creativity, and even change management. The app’s interactive showcase allows you to go through all of the lands and attractions of the park, to learn fascinating details about how Disney really works. The app provides guests visiting the magic Kingdom instant access to a world of information, enhancing their Disney theme park experience. Even the biggest Disney fan will find something new they might not have know before. This is only the first of many Apps to come. Work is underway on an App that explores the excitement of Epcot. Eventually an App for each park will be offered as well as one that covers the rest of the Walt Disney World Resort and even Orlando itself! Future plans beyond that will include Disneyland and the international parks. If you love the insights of Disney, it’s a collection that you will definitely want to acquire. 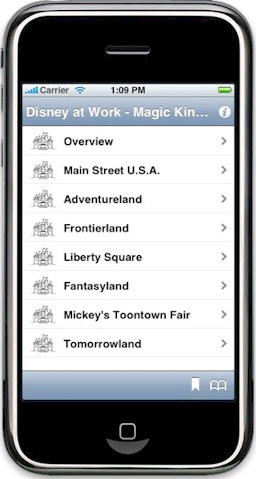 The “Disney at Work: Magic Kingdom” app for iPhone and iPod is now available at the App Store for a limited time at $4.99 (USD).